In 1687 Jean Richard de Tibante, a military serviceman of the Dutch Republic, was taken prisoner of war by the French army. Two years earlier the French king Louis XIV had revoked the Edict of Nantes. By that the Huguenots – the French protestants – lost their rights and liberties that had helped them to survive as a minority. Many of them took refuge abroad, for example in the Dutch Republic. There they were received with great hospitality, especially by their co-religionists of the Walloon churches (the francophone sister of the Dutch Reformed church). Many Huguenots with a military background earned their living in the Dutch army. When caught in the flight from France, one risked being sent to the galleys. That penalty was a certainty for military men from hostile countries being taken prisoner of war, as happened to De Tibante. Secretly he wrote letters on board of his ship La Patronne, which he tried to smuggle to his family in the Dutch Republic. In this letter written in 1701 he advises his daughter Nannon – his wife had died two years earlier – not to come and visit him in Marseille. ‘What kind of pleasure would it be to me to see you in the most barbaric country in the world?’. He complains that he would have been released a long time ago if he hadn’t been a native Frenchman. But his case is examined again recently and by that his hope is revived. 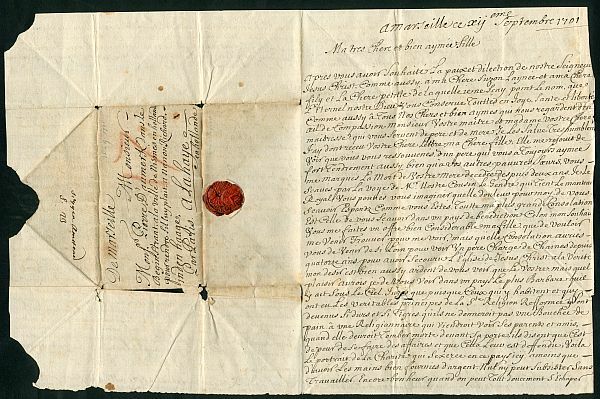 Nannon has to draw up a petition for pardon – the text is written down in the letter – and to try to offer that to the French king in Versailles. In reaction to an other petition for pardon, De Tibante was released indeed on 12 October 1701, a month after the letter was sent. We don’t know whether he succeeded in returning to the Dutch Republic and embraced his children. He was broke and they didn’t seem eager to see him. Moreover, on his way to the north he was arrested again and imprisoned for two years.